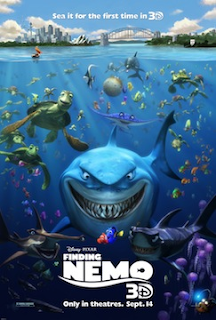 Dory, Marlin, Nemo, and their fishy friends are coming to theaters September 14th for the first time in 3D! “‘Finding Nemo’ was originally shot in 3D,” said John Lasseter, chief creative officer for Walt Disney and Pixar Animation Studios and the film’s executive producer. “At last, with today’s technological advances, this spectacular underwater world can be seen as it was intended—showcasing its eye-popping detail and breathtaking colors to both theatrical and in-home audiences and creating atruly immersive experience.